Welcome to the Hawkestone Yacht Club Beer Can Racing page. Racing at HYC is designed to maximize fun, learning and safety. 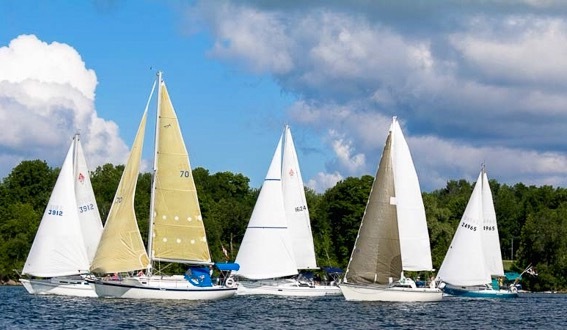 Many boats come out with friends and family aboard who have no experience and are looking to enjoy some sailing along with other boats and crews. The HYC Beer Can Rules of Racing are posted on the wall inside the clubhouse. They are quite entertaining and reflect the the main goal of Beer Can Racing. These races allow any skipper and crew on any boat to come out, get in an hour or so of sailing, increase sailing skills and enjoy the fun and fellowship during and certainly after the race!! With a unique scoring system developed with a view to provide a level playing field for all boats, literally, any boat can win!! Come out for the race and stay for the fellowship!